Today's paper carried an Associated Press story about a man in Kuala Lumpur, Malaysia, who received a $218 trillion phone bill from Telekom Malaysia. Talk about sticker shock! 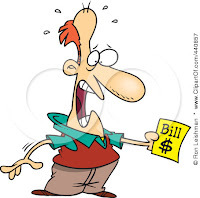 Does the old adage of "ask and you shall receive" still works, especially when it comes to paying your bills. Do you get sticker shock when you see the figure in the "amount due" box? Did you ever wish there was something you could do about lowering that figure? ... short of discontinuing the service in question? I discovered this week that calling the company and asking them what they can do to help goes a long way into lowering my monthly bills. As I went thru my pile of bills, I picked up the cable/high speed internet one. $121.18/month... and I don't even watch TV! So I called them and asked if there was anything they could do to lower my cable bill. I mentioned that I'm getting lots of offers from other venues that seem to be a better deal than what I'm spending with cable these days. Their response? They'll cut my monthly bill in half for the next three months and said to give them a call after that to see what else they could do for me. So, for the next three months I'll be paying $52.60/month for the exact same service I've been paying $121.18. This week also I dealt with the grandaddy of domain name registrars. A client had been paying $34.95/year to renew their domain names and wanted our company to start managing their domains instead. We charge our clients $33 for a 3-year renewal. So I called the company and started the transfer process. Their response? "We'll let you stay and charge you $9.99/year to renew your domain names." I asked them why they do not list this option on their website. They replied, "It is only available to those who ask." In the case of our man in Malaysia I'm sure he's already called his phone company. Have you ever called and asked a company to work with you to lower a specific bill even if there was no error in the billing? I was fascinated to see that companies seemed to have better deals available...but only for those who asked.